Today, someone who wants to switch from Windows to Linux asked me if I could help him run ESA SNAP on Ubuntu. I thought it would be interesting for the blog, too. For those who don’t know: ESA SNAP (Sentinel Application Platform) is the common architecture for all Sentinel Toolboxes. Important: You need Java for the installation. I recommend that the latest version is installed on your Ubuntu Linux. Now you are ready for the installation process. Download the Unix 64-bit .sh file for the current (5.0.0) SNAP version. If you want to use the Python interface later on, choose your favored installed Python version. If there are Updates available, SNAP will notify you in the lower right corner of the GUI. If you wish to install Plugins, such as SEN2COR, go to Tools>Plugins>Available Plugins. 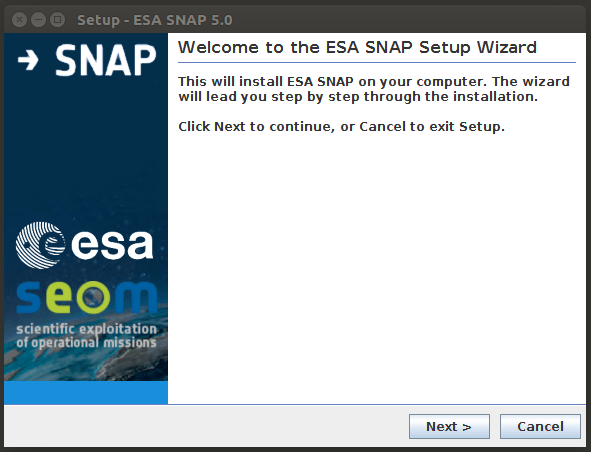 ESA SNAP should not be installed using “sudo”. While your instructions do work, running a system as complex as SNAP with root privileges is dangerous as a bug could affect the whole system. SNAP is desinged to be installed and run by an ordinary user. If that fails for you, there are likely files that should be owned by you that are now owned by “root” as a result of abusing the sudo command. What a need to do? Thank you!